A Scandal and a Treaty? In an earlier post, I mentioned discussing the previous eclipse with a group of astrologers at the beginning of the month. For the previous eclipse, I had guessed "ebola outbreak". We also discussed the next eclipse, for Washington DC. My guess was "banking collapse", and I added that during this eclipse set we would be more likely to see a peace treaty than a new war. Here are the chart, and some observations on it. 1. Eclipse in Scorpio, in the Seventh House, conjunct Pallas and Venus. This looks like a peace and/or economic agreement with a foreign power. The Scorpio placement suggests that elements may be hidden. 2. Pluto at the MC. Looks like a power upheaval: somebody at the top of the power pyramid losing his/her place? 3. Mars in Sagittarius in the Ninth House sextile the eclipse. At the anoretic "finalizing" 29th degree, no less. This supports the foreign agreement theory. 4. 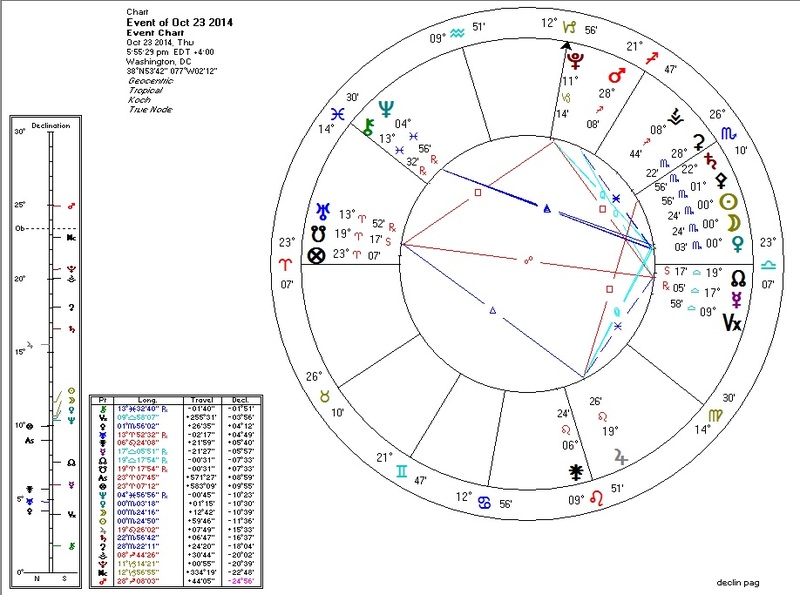 Venus (ruling the Second House) conjunct eclipse, trine and parallel with Neptune and widely conjunct North Node. This suggests the dissolution of assets, perhaps with the possibility of the future accumulation of wealth. 5. Jupiter in the Fifth House trine the South Node in the Twelfth. This could relate to Pluto at the MC. When we've looked at Jupiter with the South Node on this blog before, inconvenient secrets have come to light. Power upheaval, foreign treaty, spilled secrets, and/or financial action? Perhaps two separate events: the breaking of a public scandal and an under-the-radar economic pact? astrolibertarianOctober 24, 2014 at 9:10 AM New evidence supporting the narrative of Ferguson shooter Darren Wilson, a possible Ebola outbreak in NYC, the re-emergence of Monica Lewinsky, tension between the Democrats and Obama, and the Canadian Parliament shooting. No "scandal" per se, but plenty of potential embarrassment. No treaty, either, but the Sun-Pallas conjunction hasn't peaked yet. ReplyDelete astrolibertarianNovember 1, 2014 at 4:27 AM Sweden recognizes Palestine. http://www.infowars.com/israel-recalls-envoy-after-sweden-recognises-palestine/ Hungary suspends internet tax. http://astrolibertarian.blogspot.com/2014/11/hungary-suspends-internet-tax.html These are Sun-Pallas events. Interesting that the eclipse did not trigger them early.